After configuring your Jenkins nodes, make sure that when you connect to them, no additional login screens or account selection windows appear. In Windows 10 and Windows 8 – Allow remote connections to this computer. In Windows 7 – Allow connections from computers running any version of Remote Desktop (less secure). Add a user account under which you will run tests on a slave machine to the Remote Desktop Users group. Make sure that the user account has a non-empty password. Otherwise, Jenkins will not be able to connect to the remote machine and run TestComplete tests on it. On your slave computer, open the Group Policy editor (type gpedit.msc in the Search dialog and press Enter). In the list on the right, double-click the Always prompt client for password upon connection item. Click Disabled and then click OK.
Repeat step 2 for the Prompt for credentials on the client computer and Require user authentication for remote connection by using Network Level Authentication items. If the computer belongs to a domain, you may need to ask your system administrator to disable these policies on the domain controller as well. If the slave computer is running under Windows 10, enable the Require use of specific security layer for remote (RDP) connections group policy and set the security layer to Negotiate. In the tree on the left of the Group Policy editor, select Local Computer Policy > Computer Configuration > Administrative Templates > Windows Components > Remote Desktop Services > Remote Desktop Session Host > Security. In the Setting list on the right, double-click the Require use of specific security layer for remote (RDP) connections item. In the subsequent dialog, click Enabled. In the Security Layer drop-down list of the dialog, select Negotiate. Click OK to close the dialog and save the changes. If the slave computer is running under a non-server edition of Windows and it has other users logged in, log off those users. In the tree on the left of the Group Policy editor, select Local Computer Policy > Computer Configuration > Administrative Templates > Windows Components. Then, select Remote Desktop Services > Remote Desktop Session Host > Security. In the tree on the left of the Group Policy editor, select Computer Configuration > Administrative Templates > Windows Components. Then select Remote Desktop Services > Remote Desktop Session Host > Connections. In the list on the right, double-click the Restrict Remote Desktop Services users to a single Remote Desktop Services session item. Click Enabled and click OK. In the list on the right, double-click the Restrict Terminal Services users to a single remote session item. If the node is running in Remote Administration Server mode and there are user sessions opened on it, close unnecessary sessions. If the slave computer is configured to show a logon message when a user logs on, disable the message. In the tree on the left of the Group Policy editor, select Configuration > Windows Settings > Security Settings > Local Policies > Security Options. In the list on the right, double-click the Interactive logon: Message title for users attempting to log on item. In the resulting dialog, set the title of the logon message to an empty string and click OK to save the changes. Then, right-click the Interactive logon: Message text for users attempting to log on item. Set the text of the logon message to an empty string and click OK.
On your slave computer, open the Registry editor (type regedit in the Search dialog and press Enter). Make sure that its LegalNoticeCaption and LegalNoticeText values are set to an empty string. You can check whether the slave computer is configured correctly by connecting to it manually. If it does not show any additional messages or prompts, the group policies are configured correctly. Otherwise, you may need to ask your system administrator to disable those messages. On the target PC, press Win+R to open the Run dialog. Type control userpasswords2 and press Enter. In the subsequent User Accounts dialog, switch to the Advanced tab. Unselect the Require users to press Ctrl+Alt+Delete option. To avoid issues during the testing, make sure that, when you connect to the remote machine, its desktop opens up immediately – that is, no additional screens appear (such as the login form, account selection window, or RDP Certificate Warning windows). To learn how to disable these additional screens, contact your IT department. TestComplete will not have access to the user interface on the computer and will be unable to simulate user actions. Your automated tests that simulate user actions against GUI elements will fail. TestComplete will not be able to run tests in the CrossBrowserTesting cloud. The test step will fail. If you connect to the slave computer using the Jenkins slave agent running as a Windows application (launched via Java Web Start), TestComplete will run under a user account and can interact with GUI elements. Configure your TestComplete Test build steps in your Jenkins projects to open an interactive user session in which they will run. See the description of the Run interactive user session option of the TestComplete Tests build step or the description of the useTCService parameter of the step (for Pipeline script). If no interactive user session is open, your tests will fail. This feature is available only if you use TestComplete 10.60 or later. If you use TestComplete 10.50 or earlier, connect slave machines using the Launch slave agents via Java Web Start launch method. On Windows 8 and later, TestComplete requires elevated permissions for the run. Jenkins that is run through the Java Web Start agent application, cannot start TestComplete with required permissions, and will cause the build step to fail if it tries. Install the Java Web Start agent as a service. As a service, the agent has the required permissions and can start TestComplete. Make sure the "Run interactive user session" test step option is selected. Connect to the slave by using the "Let Jenkins control this Windows slave as a Windows service" launch method. Make sure the "Run interactive user session" test step option is selected. Disable support for testing Windows Store applications. With this option disabled, TestComplete can be run without elevated permissions. In TestComplete, you can run web tests in testing environments provided by CrossBrowserTesting.com. To learn more, see Integration With CrossBrowserTesting.com. The TestComplete version must be 12.20 or later. TestComplete on your Jenkins nodes must have an active license for the TestComplete Web module. You must have an active CrossBrowserTesting account. On your Jenkins nodes, provide valid account information for TestComplete to connect to the CrossBrowserTesting cloud. 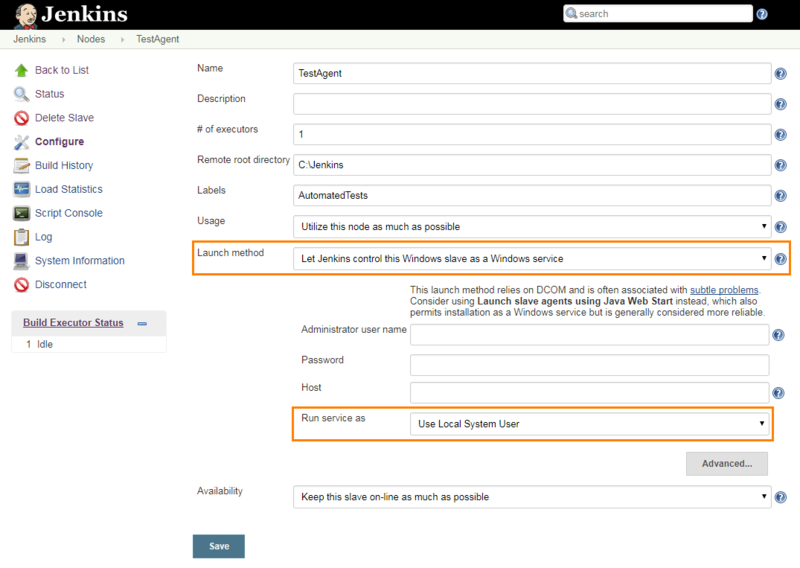 Log in to your Jenkins nodes using the Windows user account under which the tests will be run. TestComplete associates the CrossBrowserTesting account with your Windows account. So, it is important that you log in to your Jenkins nodes, set the CrossBrowserTesting account in TestComplete, and run the tests later under the same Windows account. Open any project suite or create a new one. In the Project Explorer, locate the CrossBrowserTesting item. Double-click it to open. Click Sign In or Free Trial and then click Sign In to open the Sign In to Your Account dialog. In the dialog, enter your CrossBrowserTesting account credentials. TestComplete will save the credentials and will use them for all project suites you will run under your current Windows account. Close TestComplete and log off. To learn more, see Connecting to CrossBrowserTesting.com From TestComplete. In addition, configure your test step to run TestComplete in an interactive user session under a user account (see below). Otherwise, the test step will fail.